“Yeah!” Zee let out a whoop and ran to find some shoes. The first animals they came upon were the size of squirrels. Furry and blue, each little animal carried a tiny box as they unceasingly zipped back and forth. In Kubernetes, Pods are responsible for running your containers. Every Pod holds at least one container, and controls the execution of that container. When the containers exit, the Pod dies too. As Phippy and Zee walked on, they saw a large glass enclosure. Pressed against the window was a line of happy little meerkat faces. “Those are the ReplicaSets,” said Phippy. As Zee watched, the face on the right grinned widely, and tipped itself off the ledge. In unison, the others hopped over to fill the space, and then an identical meerkat scurried up on the left side. “Every time one little replica falls, another one hops right up,” explained Phippy. 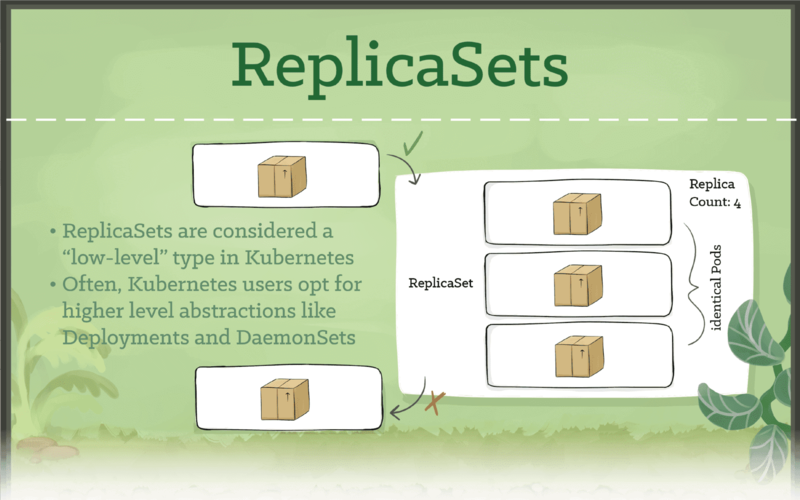 A ReplicaSet ensures that a set of identically configured Pods are running at the desired replica count. If a Pod drops off, the ReplicaSet brings a new one online as a replacement. Walking further, Zee pointed out a clump of burrows and warrens. While there were plenty of signs that the area was inhabited, neither Phippy nor Zee could see a single movement. Zee took the pair of glasses Phippy offered, slid them on, and blushed. “Oh, my. I think I’m ready to go on now, Aunt Phippy.” Zee handed back the glasses, and onward they went. Secrets are used to store non-public information, such as tokens, certificates, or passwords. Secrets can be attached to Pods at runtime so that sensitive configuration data can be stored securely in the cluster. A group of iguanas gathered near a large slingshot along the shore of a pond. An island stood in the center of the water. An iguana threw herself into the slingshot and the other iguanas launched the little beast toward the island. “The Deployments release a group onto the island. Right now, they’re trying to get three out there.” said Phippy. At that moment another iguana rocketed into the air but missed the island with a colossal splash in the pond. A Deployment is a higher-order abstraction that controls deploying and maintaining a set of Pods. Behind the scenes, it uses a ReplicaSet to keep the Pods running, but it offers sophisticated logic for deploying, updating, and scaling a set of Pods within a cluster. “I bet that if we added a new pillar, a new bird would land on it faster than you could say ‘cube cuddle,’” chuckled Phippy. DaemonSets provide a way to ensure that a copy of a Pod is running on every node in the cluster. As a cluster grows and shrinks, the DaemonSet spreads these specially labeled Pods across all of the nodes. As they walked on, they saw an aquarium with an enormous reef. Edge-to-edge, it appeared that the rock would keep anything from passing from one side to the other. Zee watched as hundreds of tiny fish made a dash for the center of the face of the rock. At full speed, the fish swam into a hole bored into the rock face and momentarily vanished from sight. Zee let out a gasp. Multicolored flashes erupted from the opposite side of the coral. Instead of coming out of a single hole, the fish seemed to materialize from tiny fissures all over the far side of the rock. “Ingresses are beautiful,” said a dreamy eyed Phippy. Ingresses provide a way to declare that traffic ought to be channeled from the outside of the cluster into destination points within the cluster. One single external Ingress point can accept traffic destined to many different internal services. Suddenly, one sprung to its feet, did jumping jacks, then settled back down for another nap. As she spoke, another bolted upright, grabbed a broom, swept the entire enclosure, and then dropped off to sleep again. “Aunt Phippy, can I bring that one home to clean my room?” Phippy laughed as they walked on. CronJobs provide a method for scheduling the execution of Pods. They are excellent for running periodic tasks like backups, reports, and automated tests. Zee halted abruptly. In the distance, a black-railed fence arose. The arches above the pen were marked C-R-D. Between the bars, Zee could make out some peculiar critters. 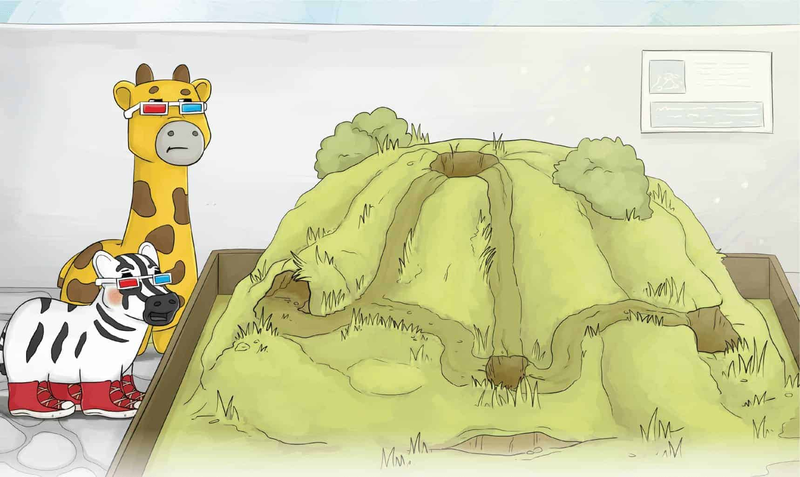 A giraffe with a hippopotamus head. A snake with raccoon ears. A lion with a beaver’s tail. A unicorn with no horn. Zee wasn’t sure she liked the looks of that place. CustomResourceDefinitions, or CRDs, provide an extension mechanism that cluster operators and developers can use to create their own resource types.